A brief look at how the EU itself uses the World Trade Organisation (WTO) to facilitate its trade with the rest of the world. As ever, we will use the EU's own information as much as possible. 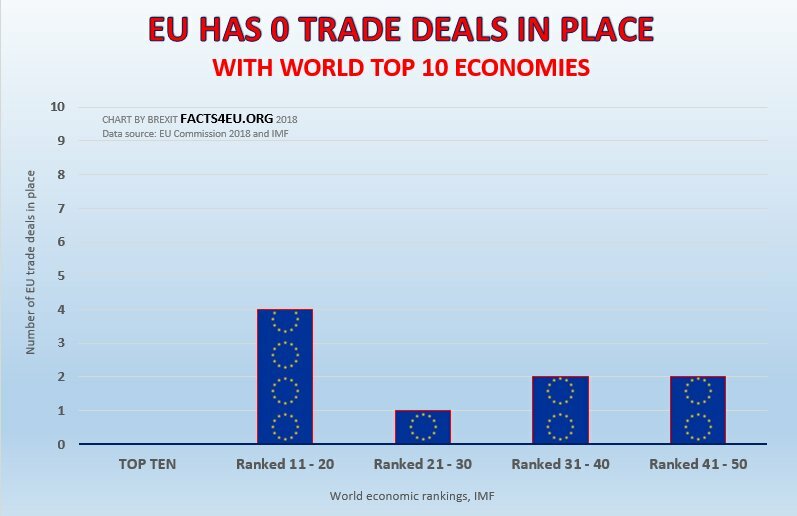 EU is committed to trade that is "fair, predictable and based on common [WTO] rules"
It's clear then that the EU uses the WTO for international trade, just as the UK could upon exit. What are the EU's Objectives at the WTO? Most readers will agree that the EU has laid out its stall. Its primary objective is to make trade "fair, predictable and based on common rules". It does not state that it wants to make trade as difficult as possible for one country (the UK) that had the temerity to reject EU membership. Is the UK a Member? 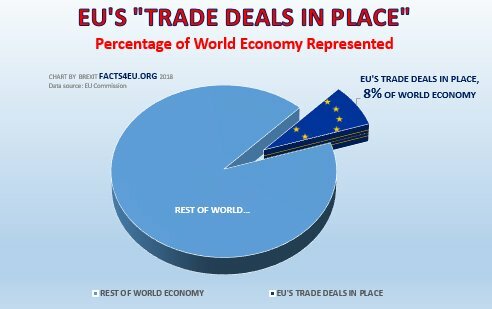 Here is how the EU has taken over the whole area of trade. The Commission coordinates the EU negotiating position with the EU Member States by consulting with the Council's trade policy committee . The Commission regularly informs the European Parliament's International Trade Committee (INTA ) of WTO issues. As readers can see, the EU has taken over the voice of its member states. No individual country can represent the needs of its own industries, service providers, farmers, fishermen, or indeed the needs of its own consumers in regard to imported products and services. The unelected EU Commission might ‘consult' and ‘inform' member states via the Council and EU Parliament, but its agenda is control and uniformity. Please note that we have used the EU's own definition of "Trade deals in place", which means negotiated and ratified. Naturally in the top ten economies there are some nations that are member states of the EU, such as the UK which is in 5th place. 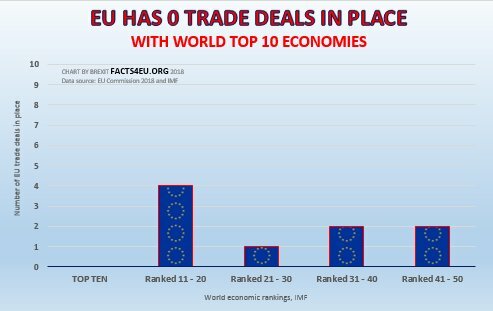 However the EU has been unsuccessful in all the years of its existence in striking and ratifying trade deals with the other members of the top 10. In practice, the EU Commission is representing 28 economies which are vastly different. The trading priorities of a country like Romania or Slovenia are completely different to those of an enormous, developed economy such as that of the UK. The French government suffers from powerful lobby groups such as the farmers who regularly block motorways, ports, the streets of Paris, etc. For Monsieur Macron, preventing the imports of cheap food and protecting the name ‘champagne' have high political priorities. And because we're talking about France, the Commission goes out of its way to appease and adopt the same priorities. This is precisely why the UK will benefit so much when it regains its independence and sovereignty. Once again, the UK government will be able to speak and negotiate at the WTO in the interests of its own businesses and its own people. We have shown how the EU uses the WTO rules for trading with other countries. This is very well-established. We have also shown how the EU is committed to fair practices based on common WTO rules. If the EU obeys the rules, then the UK will be doubly efficient in this regard because that's the way the UK has traditionally been. Many would argue that the UK is overly scrupulous in its adherence to international agreements, when others are less so. Trading under the terms of the WTO is what the EU does. If it's good enough for the EU when the UK is still a member, how can it behave otherwise to the world's fifth-largest economy when the UK becomes independent? Let's go WTO on 29th March.